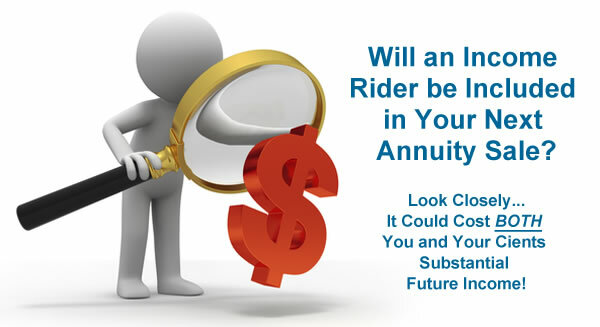 Most of you sell annuity income riders. In fact, we estimate that more than half of ALL annuity sales feature some type of income rider. With that said, did you know income riders can cost both you and your clients substantial future income? It’s surprising, I know, but there is a solution. It helps you win the case over any income-planning competitor. Best of all (we think so anyway), the system provides a legitimate door-opener for future sales and commissions for you! Call 800-747-5612 or email me @ Alison@davislife.com TODAY! Mention that you saw The Income Maximizer on our website. I’ll immediately give you all the details you need to start using it for free – preferably before your next annuity sale! Let’s make it happen! Contact me today.